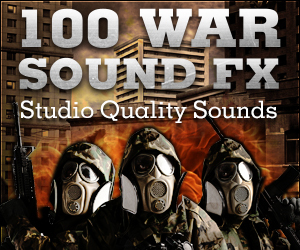 100 War Sound FX is a collection of studio quality sound clips that range from weapons used in the early 1900’s to futuristic ones like ray guns and heat rays. This video is a low resolution preview of that includes many of the sounds that are included in the pack. All sounds are original and royalty free for commercial use once you’ve purchased them. If you want to check the list of sounds out its just below the video demo.